And yours truly hopes to be there trying it out! How did you get tickets to CES? - That last one is extremely important! That's cool. I'm trying to see if I can get a badge through my company who is also going to be exhibiting there. I want to demo the omni it before deciding whether to pre-order it. I think it will be cool but I haven't had a chance to demo it yet. I'd volunteer with you guys but you probably don't want to give a badge out to a noob. You won't be disappointed. VR is the future of home recreation, and the Omni is the best way of navigating it. It amps your enjoyment up to the max and effectively eliminates motion sickness, provided you have a good HMD. The only trouble is if you stay in there long enough it might turn you into an adrenaline junky IRL! I jumped off the top of my hotel after demoing it at CES last time (SkyJump at the Stratosphere) - I guess I missed the thrill of being shot at in Team Fortress 2. Sadly there aren't enough units to let everyone have a go so mainly limited to press, but yeah come by the booth if you can make it and see it in person! Hopefully there'll be Omnis in gyms and arcades so people can try before they buy. only 1 day to go, can't wait to see what it's like. maybe different colours, a smaller model? yeah Noticed that, it has all been leaked however the website has also changed dramatcially with new pictures. looks like it has gotten larger, from 45" to 50" diameter. these tracking pods are new, not much information about them, like their size or how they attach to the shoes, I thought the sensors were inside the base of the omni. Actually looking at the backpack it appears MUCH smaller, I hope it's 30" diameter, can anyone confirm. Looking at this screenshot seems is about 3x his foot length, maybe about 35", I am refering to the diameter of the foot plate only, not the posts. the website is misleading now, it says 50" and it also says 45" on another page. the prototype was 45", I would guess now they have separated the harness into its own thing, and we are left with a 35" foot plate with 2x 7" posts that are external to the footprint. I wonder how hard it would be to add crouching ability to those harness posts, that may be feasible later. I am actually rather concerned about the size of the base now. It does look smaller. It seems small enough that hitting the posts with you feet seems like a real issue. In the new Modern Warfare video at 37 seconds in his heal actually hits the right post once. If he was turned a bit he would have hit the post 5 or six times in a row. I can see that not only breaking emersion but just being plain annoying. The new website is fantastic, can't wait for the reaction at CES. yes I thought of that too, seems the base plate is 3x shoe length in length, at that point people would bump into the posts depending on shoe size. The actual thing is finally here ! Looks great... looking forward to decorate my living room with one of these ! - I think the Kickstarter community would appreciate a little update about the new website and design and everything... the promised "special update from us before the opening of the show with images and videos of the final Omni design." 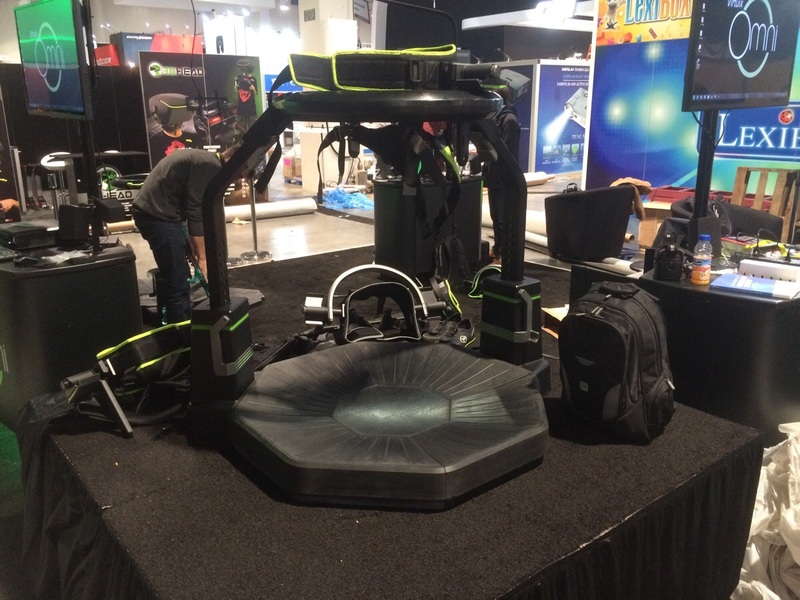 I wish all the Virtuix team have a great time at CES ! @Trabbi‌ Yes the Pods are included as the capacitive sensors have been replaced. man that price increase is quite a bit no? Hopefully someone can get some confirmation on its dimensions. any clues as to the 'tongue' that appears beside the omni, is that for stability purposes? can that not just be removed? also can you sidestep and backpedal in the consumer model, seems some articals are saying you can only move forward now. in the new CoD video I didn't see him sidestep or backpedal. That’s a good point @OculusRiftRocks between that and the smaller size I am not impressed with this reveal. maybe the tongue could be cut off and they add weights to that side of the omni to keep it stable? "also can you sidestep and backpedal in the consumer model, seems some articals are saying you can only move forward now." From the latest update : "The POD not only accurately tracks forward motion in any direction, but also strafing and backwards walking or running at analog speeds, and even jumping." But I also guess that it was not added for nothing and offers a nice increase of comfort when entering the Omni. The "tongue" seems fairly pointless to me. Just adding cost. Its not its a huge step into the Omni, its what 6" max. no the "tongue" will serve a purpose, it will be there for a reason, absolutely no one would want it as 'comfort?' as it adds on to the footprint, so it must have a real function. on strafing, seems to apply to the demo people were using. "The version of the Omni I used was a pre-production model, and only had the forward-walking function integrated into the demo, but the final version that will ship to users will allow for movement in any direction." jan 7 2015. Overall, the CoD demo did not involve a lot of movements, mostly slow walk an a bit of running. Dont forget about all the foot-hitting-support-post action! Sorry I know im harping but its really bothering me. I guess the only way t know is to tryby yourself. 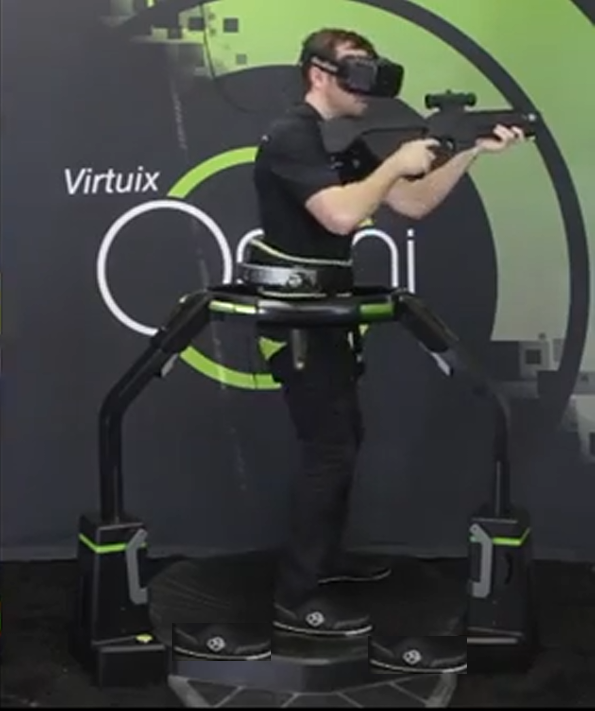 I trust the Virtuix team to have experimented with different sizes before settling for this solution. In any case, an answer from them on this subject could help ! yes on space occopuation, but then what about the tongue? lol seriously if that really does nothing im just gonna take a chainsaw to mine as I simply wont be able to open the door to get into my room as the omni 'tongue' would hit the door. foot hitting post wont bother me as I have small stride, I still think they should have 2 omnis, one for walking only or 5' 6" and under people, which is 30" diameter, then one for tall people with big strides that want to run, which is 40" diameter. The addition of the "tongue" (or footplate) is a really neat idea. It adds to the stability, and also has a rubberised surface so you can stand there while you put on/remove the shoes (especially useful if your Omni is on a hard surface). It's pretty futuristic-looking too. yes but can you not just add weights to the omni base thus you wont need the footplate. ah yes of course I was referring to 'off the record could you do this'. I thought since the omni base is now smaller and presumably lighter than the prototype it needed that footplate to make up for its smaller size and weight. but that footplate is very thin compared to the omni base, i'd be surprised if it made that much of an impact, if stability was its main function it would certainly be much thicker than it is currently. I noticed you use the phrase ' I can't recommend not installing it', but to double check with you is the footplate removable and thus can instalation be avoided?